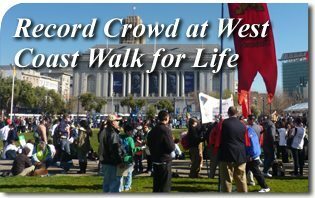 On a crisp, cool and clear sunny morning blanketed by deep azure skies, a multitude of animated pro-life supporters amassed at the Civic Center Plaza in San Francisco, California to send an emphatic message to the promoters of the culture of death that is wreaking havoc in our days. The motley mix of infants, toddlers, teenagers, thirty-somethings, baby boomers and septuagenarians underscored the event’s broad grassroots appeal.Past midday, an hour long rally on the grounds in front of City Hall preceded the momentous march which attracted a throng of 50,000 spirited people. An array of speakers made up of pro-life leaders and activists, abortion victims and survivors, as well as distinguished clerics graced the occasion, most prominent of whom were His Excellency Archbishop Carlo Maria Vigano, Apostolic Nuncio to the United States, and the Most Reverend Salvatore J. Cordileone, Archbishop of San Francisco. 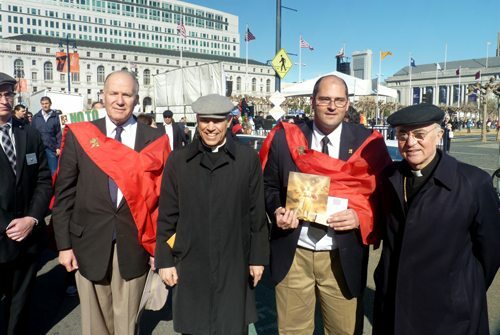 Among the distinguished speakers at the Walk for Life was His Excellency Archbishop Carlo Maria Vigano, Apostolic Nuncio to the United States, and the Most Reverend Salvatore J. Cordileone, Archbishop of San Francisco, seen here with TFP members Mr. Philip Calder and Mr. Michael Whitcraft. TFP members Philip Calder and Michael Whitcraft greeted and chatted briefly with the august prelates shortly after they spoke to the galvanized crowd and moments before the march officially started.The massive sea of marchers walked along a two mile stretch of Market Street that took them right into the city’s popular business and shopping district and ended across from the famous San Francisco landmark, the Ferry Building. 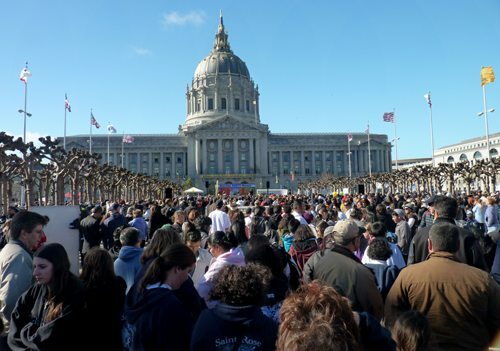 A partial view of the record 2013 gathering of pro-life supporters in San Francisco, California. 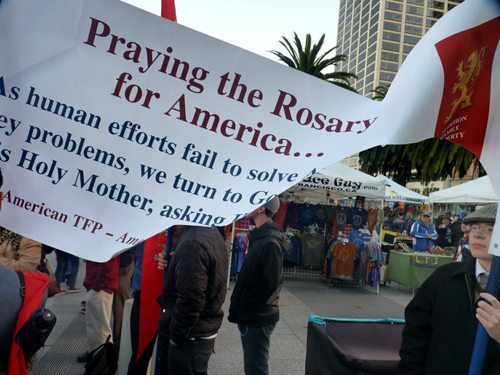 A handful of vociferous counter protestors showed up to manifest their opposition which did little to dampen the overwhelming enthusiasm of the advancing and parading pro-life legion.At the end of the successful march, an incident marred the TFP’s day of campaign when a visibly upset woman tore one of the group’s banners. TFP volunteers promptly called police who arrested her and then filed charges. The TFP banner that was vandalized by a woman who couldn’t tolerate opposing opinions. 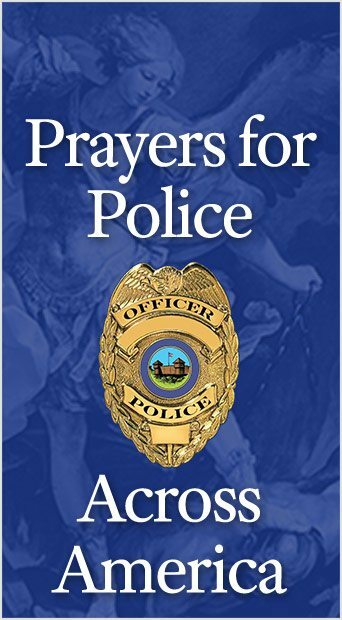 This entry was posted in In Defense of the Unborn and tagged Apostolic Nuncio, Archbishop, arrest, California, Carlo Maria Vigano, Coast, life, march, member, pro-life, Salvatore Cordileone, San Francisco, TFP, walk, west by Dr. Jose Maria Alcasid. Bookmark the permalink.